. . . which means it's Eventide Sew Along Update Day!! And boy do we have some great updates, most of the folks sewing along have at least made their fabric selections and I think most of us have also done a little cutting and sewing! 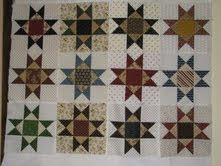 After I finished my large hour glass blocks, I decided to move on to the Ohio Star blocks with the colored corners. Eleven of them, all done! so I cut the rest of the fabric for the remaining Ohio Stars. Enough about me, here's what everyone else is doing!! 12 Ohio Star blocks. Deb is using Jo Morton fabrics for her version of Eventide. It looks good to me Deb! Anita is cutting out and piecing a few blocks to get a feel for her fabric, Rural Jardin. DZJ has joined the fun and is using Martinique fabric. Gretchen, at Stella Bella Quilts has decided to exchange her original fabric choice, Central Park, for some Fig and Plum by Fig Tree, which gives our group 3 Fig Tree projects. Stop by her blog to see if over the past week she was able to untie and start cutting that lovely bundle of fabric. Brenda - Quilting Along Life's Way has decided to use Luna Notte for her Eventide. Chris is going with Minnick & Simpson's Charlevoix. Sharrieboberry at Needles Zing has pulled a lovely assortment of pastel fabrics from her stash for her Eventide, the colors are fresh and say spring to me, our first true scrappy Eventide I think, take a peek. Sherri at A Quilting Life blogged on Friday about her Eventide fabric choice, a very interesting combination of Park Avenue (the fabric I'm using) and Maison de Garance (which I'm also using) with some Rouenneries thrown in. (which I'm not using) I'm eager to see Sherri's version because she dropped the blue from her Park Avenue family, the color I struggled with but decided to keep in my version! Stop by and take a look, I'm intrigued! Carol at This and That has decided on Wiscasset and has made her first Ohio Star block. Judith at Smokey from the Netherlands got her pattern - a good first step! Lisa - Stashmaste has cut out all the fabric and immediately went to piecing the quarter square triangle units for the Ohio Stars. Her sewing table is a beautiful assortment of Luna Notte bits and pieces. I think it looks Like Nicole at Sisters Choice Quilts is leading the pack, her design wall is filling up fast and looks great! Shelley at Poplun is like most of us, she has a sewing room with many projects in various stages but has decided to sew along and finally make a quilt for herself. Good for you Shelley, I'm happy you're putting yourself on your To Do list! 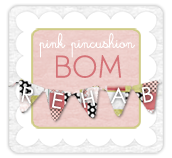 Sinta - at Pink Pincushion is going to town on Eventide too, great job Sinta! Sue - at Cozy Little Quilts is giving Nicole a run for her money on finishing her Eventide first. Sue's design is filling up too! Sue, your Luna Notte fabric looks wonderful on your design wall. Sarah has started the cutting (a big job that thankfully is behind me!) her Luna Notte fabric and is going to start sewing today! Sarah's super sizing her Eventide, she want's to make it "fit for a king", by adding some borders. I'm curious to see Eventide surrounded by borders and am giving this some thought too! That's all the updates that I caught this week, but after being out of town I am a little behind on my email, so if I missed you this week I'm sorry and I'll catch you next week! The comment winner from last Tuesday's post, is Baskets of Quilts. You're the winner of any Carrie Nelson pattern currently available from the Fat Quarter Shop. Congratulations and thanks for leaving a comment. Drop me a note with your selection and address!! This week's sew along winner is Cheryl! This week's giveaway is any quilt book currently available from the Fat Quarter Shop. Cheryl, send me an email with your book choice and mailing address! If you would like to win a quilting book of your choice from the Fat Quarter Shop, leave a comment on this blog. You have until midnight, CST, Wednesday, March 2nd to be eligible. Any comment would do, but I love quilting books, and would be interested in knowing what is your all time favorite quilt pattern book. Everyone is moving along so well! Thanks for the updates, I've been enjoying the journey. I had forgotten to post my favorite book on my first post.. As of today, my favorite book is Miss Rosie’s Spice of Life Quilts. It has so many quilts I would love to make, it's my favorite!! It's looking good and I found a few more blogs to follow! Scrap Basket Sensations is my favorite book right now, have to make some of those quilts. Love looking at how the other Eventides are turning out, they're going to look so different when they're all done. I'm hoping to have some time today to begin cutting my Eventide. I'm planning on using Rouenneries, Rural Jardin, Maison de Garance and some additional blue from my stash. Love seeing the fabric choices and blocks from other quilters. Probably my favorite book is 40 Fabulous Quilts by Evelyn Sloppy. This books is great for using stash fabrics. Have a wonderful day! There are so many excellent books of quilt patterns out there it's hard to choose. One of my favorites is Nine-Patch Extravaganza by Judy Laquidara - they are easy patterns with stunning results. My favorite book is usually the one I purchased the most recently. Right now it's Kim Diehl's latest book. It's fun to read even if you never make a quilt from it. Lots of fun small projects too. Your eventide is looking beautiful. Lots of fabulous progress happening - beautiful quilts in the making. Wow your Eventide is looking so beautiful! I love your fabric selection. I have quite a handsome collection of quilting books, but it seems that I mostly use them for color selection. I make a lot of table runners from Eleanor Burns book "A Star for All Seasons". I also make quilts from AP&Q magazines patterns. the quilts are looking great, so jealous, How did your half marathon go! you have obviously survived! way to go. Wow thanks for picking me as last week's winner! Love seeing everyone's progress from week to week! What fun to see all the different Eventide quilts coming together. My favorite quilt books are Loose Change and Loose Change 2 by Claudia Plett and LeAnn Weaver. LeAnn is my longarm quilter and quilted most of the quilts in the books. I started the sewing progress yesterday and I love how it comes out. I am almost finished with the last cutting and than I can start the ohiostars and the innerborder. This is such a fun quilt along. My absolute favorite quilt book is "40 Fabulous Quick Cut Quilts" I think I could make all 40. A very close runner up is "Jelly Roll Quilts" by Nicki & Pam Lintott. I adore this book and have about half of the quilts made or in progress. Looks like you've all been busy & sew many lovely quilts in the works--kind of makes me want to join (but then I think of all my unfinished projects...) My favorite book is The Quilt Engagement Calendar Treasury by Cyril I. Nelson and Carter Houck. It's old and likely out of print, but I refer to it often for ideas, and just dreaming. I really like any of Kim Diehl's books. I love how you quilt is coming out! Oh I love your fabric choices! It is going to be a real beauty. Favorite book~ Kim's Scrap Basket books. I'm pining for the second one. I have two books on my wish list right at the moment. Friendship Strips and Scraps by Edyta Sitar of Laundry Basket Quilts. And another new one called Scrap Quilts Go Country... there are several fun projects in this book! Thanks for keeping track of all of us. It's fun to see the progress everyone has made and their fabric choices. I love your blocks with the red corners! I'm still working on blocks because I remember the steps for both types, but this is going to have to be resolved by the time I get ready for the inner border! P.S.~ About books, over time I've discovered that I actually make quilts from patterns, not books. I don't really know why, I love books and have lots of them. One I am definitely planning on planning on making from a book is the cover quilt on Kim Diehl's newest book Simple Graces. I have 98 fat quarters saved up for that quilt in case I decide to make it a full king size bedspread for my bed, which I really might do... the star points FLOAT, lol! Your quilt is coming along beautifully! I love seeing how the other quilters are making theirs too! I love my Schnibbles book. How did your marathon go this weekend? Deciding which quilting book is my favorite is hard! I love Kim Brackett's Scrap Basket Sensations...and Carrie Nelson's book with Schnibble patterns in large and small sizes is a must-have as well! I love your Eventide progress! I think 40 Fabulous Quick-Cut Quilts by Evelyn Sloppy is really a great book. Every page has a quilt I want to make! Hi Thelma, I love your Eventide progress. Hard to choose a quilting book : Kim Diehl, Judy Martin, are some of my favorites. I wanted to join the sew-along, but life seems to have gotten in the way. So I'll keep on going on my WIPs and save Eventide for my to-do wish list. Am loving your coverage of the sew-along. It's wonderful to see all the fabrics, hear about the choices, and see the progress. Favourite book. 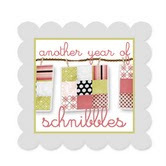 Right now I'm loving browsing through (and drooling over) Schnibbles Times Two. And Material Obsession, books 1 and 2, make for great browsing, dreaming and inspiration, too. I have a Schnibbles book out from the library and I am loving it! I have put another update on my blog for Eventide.